For the first time a structure called 'the mesh' has been identified which helps to hold together cells. They believe their study (“The mesh is a network of microtubule connectors that stabilizes individual kinetochore fibers of the mitotic spindle”), which has been published in Life, changes our understanding of the cell's internal scaffolding. The work has implications for researchers' understanding of cancer cells as the mesh is partly made of a protein which is found to change in certain cancers, such as those of the breast and bladder, according to Stephen Royle, Ph.D., team leader and associate professor and senior Cancer Research UK Fellow at the division of biomedical cell biology at Warwick Medical School. 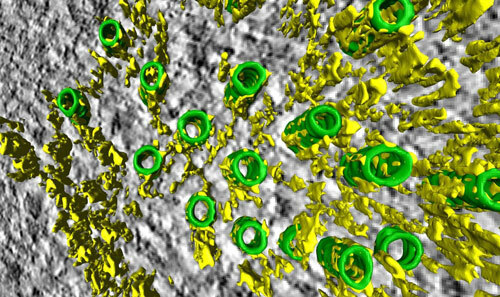 A 3D view of the mesh: microtubules (green tubes) of the mitotic spindle are held together by a yellow network, the mesh. Credit: Warwick Medical School. "As a cell biologist you dream of finding a new structure in cells but it's so unlikely. Scientists have been looking at cells since the 17th Century and so to find something that no-one has seen before is amazing," he said. Researchers made the discovery by accident while looking at gaps between microtubules which are part of the cells' internal skeleton. In dividing cells, these gaps are incredibly small at just 25 nanometers (3,000 times thinner than a human hair). One of Dr. Royle's Ph.D. students was examining mitotic spindles in dividing cells via tomography. While inter-microtubule bridges in the mitotic spindle had been seen before, the researchers were the first to view the mesh. "We had been looking in 2D and this gave the impression that 'bridges' linked microtubules together,” continued Dr. Royle. “This had been known since the 1970s. All of a sudden, tilting the fiber in 3D showed us that the bridges were not single struts at all but a web-like structure linking all the microtubules together." The discovery impacts on the research into cancerous cells. A cell needs to share chromosomes accurately when it divides otherwise the two new cells can end up with the wrong number of chromosomes (aneuploidy) which has been linked to a range of tumors in different body organs. The mitotic spindle is responsible for sharing the chromosomes and the researchers at the university believe that the mesh is needed to give structural support. Too little support from the mesh and the spindle will be too weak to work properly; however too much support will result in it being unable to correct mistakes. It was found that one of the proteins that make up the mesh, TACC3, is over-produced in certain cancers. When this situation was mimicked in the lab, the mesh and microtubules were altered and cells had trouble sharing chromosomes during division. According to Emma Smith, Ph.D., from Cancer Research UK, “This early research provides the first glimpse of a structure that helps share out a cell's chromosomes correctly when it divides, and it might be a crucial insight into why this process becomes faulty in cancer and whether drugs could be developed to stop it from happening."